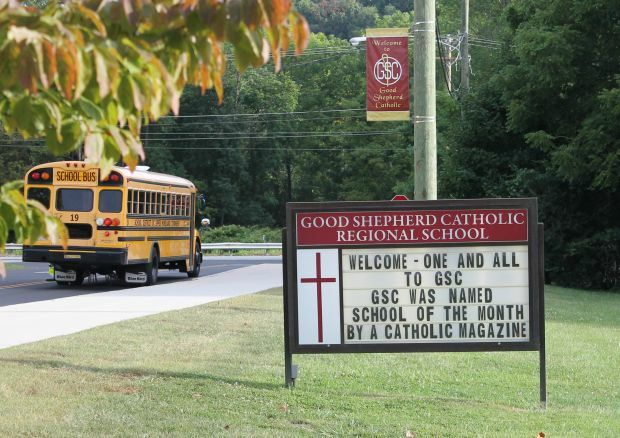 Good Shepherd Catholic School begins its fifth year with national recognition as "School of the Month" in a trade magazine. 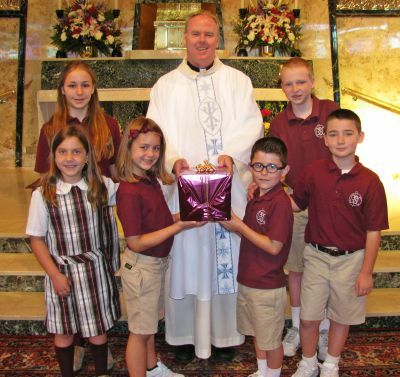 The GSC school community — represented by two eighth grade students (Sophia Panella Pisch, top left, and David Gray, top right) and their first grade “buddies” (bottom row, from left, Samantha Clewell, Taylor Dinnis, Brian Dougherty and Nathan Hess) – presents Queen of Peace Parish’s newly installed pastor, Father John Nordeman, with a “welcome” gift to mark the occasion of his first Mass with the students, faculty and staff Sept. 12. Good Shepherd Catholic School, the academy-style school on North Hills Avenue in Ardsley, already has highlights from a school year that began just last month. • The kick-off family event for GSC’s fifth year was a “Welcome (Back)” Picnic and Ice Cream Social at Roslyn Park on Sept. 5, with over 200 people coming out for a Friday night of food and fun. • The opening school Mass took place on Friday, Sept. 12, and the new pastor of Queen of Peace Parish, Father John J. Nordeman, celebrated his first liturgy with the GSC school community. The school also welcomed a new teacher in sixth grade, Colleen Sweeney, and a long-term substitute in third grade, Sister Patricia McKee, I.H.M. • Other new faces at the school include a new business manager, Marilyn Shapiro, and a full-time advancement director, Barbara Gress, an experienced professional who will spearhead the school’s new partnership with the Healey Education Foundation, a Mt. Laurel, N.J.-based non-profit organization that invests in the sustainability and growth of Catholic schools. Gress will focus her attention on enrollment (recruitment and retention), marketing, fundraising and advancing the school’s mission of God, Scholarship, Community and Service. • The Good Shepherd Home and School Association introduced the school’s first mascot at Back to School Night on Thursday, Sept. 18, and they will conduct a “Name the Ram” contest and vote in the near future. • The school held Student Council elections the week of Sept. 22, and four eighth grade officers and classroom representatives in grades four through eight were installed during a school Mass on Friday, Oct. 3. • Rehearsals have been taking place for a school show, “Once on This Island Jr.” The school’s summer theater camp students are putting on four performances in the school gym the weekend of Oct. 10-12. • The work of finalizing the plans and securing the auction items and donation raffles for the school’s second Golf Outing and Dinner, which tees off Tuesday, Oct. 14, at North Hills Country Club on Station Avenue, took place throughout the month. As the newness of the school year wears off and is replaced by the busy sights and smells of fall activities, GSC is back into a routine and using its September successes to move forward and create more highlights for its students, teachers, staff and families.